SUNY Oswego's Office of Sustainability plans to host a variety of awareness-raising events during Earth Week, April 22-26, including one highlighting such transportation initiatives as the award-winning Bus Share app to find the most efficient and convenient Centro routes. Here, in an archive photo, Peterly Jean Baptiste (left), now an alumnus, and current senior Theresa Personna display the easy-to-follow web-based application, created by 2017 alumnus Alex Monachino. OSWEGO — A panel of SUNY Oswego faculty from various academic disciplines will present their perspectives and generate an interdisciplinary discussion on “Climate Change: A Wider Lens” as a highlight during Earth Week observances at the college. 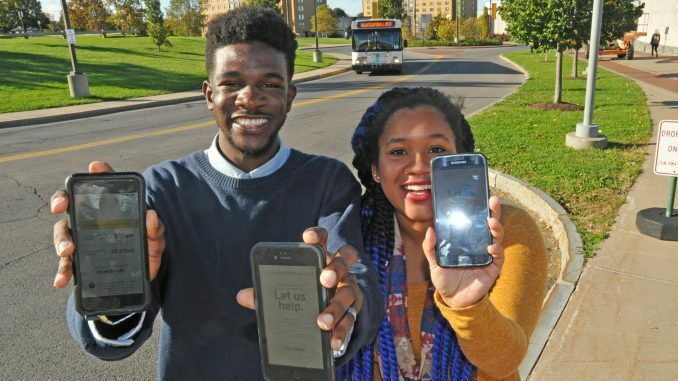 SUNY Oswego’s Office of Sustainability plans to host a variety of awareness-raising events during Earth Week, April 22-26, including one highlighting such transportation initiatives as the award-winning Bus Share app to find the most efficient and convenient Centro routes. Here, in an archive photo, Peterly Jean Baptiste (left), now an alumnus, and current senior Theresa Personna display the easy-to-follow web-based application, created by 2017 alumnus Alex Monachino. The climate change event — free and open to the public — will take place from 6 to 8 p.m. Wednesday, April 24, in Marano Campus Center auditorium (Room 132). Leigh Wilson, director of SUNY Oswego’s Interdisciplinary Programs and Activities Center, will moderate a faculty panel that includes Lisa Glidden of global and international studies, Allison Rank of political science, Elizabeth Dunne Schmitt of economics, Michael Veres of meteorology and Mark Zelcer of philosophy. The moderator will open by framing the context and purpose of the event. “As each panelist’s brief presentation progresses, Wilson will help generate conversation about contributing factors and impact of climate change as seen from the experts’ disciplines,” said Chris Hebblethwaite, chair of the Campus Environmental Advisory Committee, which is co-sponsoring the event with the college’s Office of Sustainability. “Our hope is that the audience will leave the program with a broader interdisciplinary perspective about climate change, a perspective that they will want to share with others and pursue further as lifelong learners,” said Scott Furlong, provost and vice president for academic affairs. * “On Earth Day we’re going to be sharing the achievements of the campus sustainability programs, focusing on waste reduction accomplishments,” Adams said. Save the Trees, Perk Up, Tap In, Leave Your Mark — the descriptive names denote campus-wide, student-driven projects that divert paper and plastics from the waste stream to nationwide recycling efforts. Through such programming, the Sustainability Office maintains the campus-wide focus on continuing efforts to develop students with the intellectual capability, skills and technology to become environmental stewards of the future. * Tuesday, April 23: The Office of Sustainability will promote Bus Share and Bike Share, programs that encourage use of transportation that saves on automobile reliance. 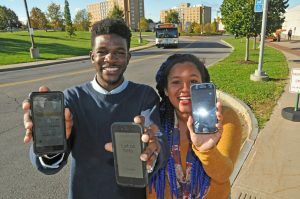 A student-designed mobile application helps bus riders find the quickest routes on campus and throughout the city of Oswego. Bike Share, since its inception in 2013, has encouraged students to help reduce the carbon footprint by sharing donated bikes that are refurbished and maintained by student volunteers. * Wednesday will be dedicated to promoting the “Climate Change: A Wider Lens” interdisciplinary discussion that evening. * Thursday will focus on Save the Trees and Laker Print. This program features voluntary pledges to reduce paper waste and promotes Ecosia as a search engine alternative. Since 2009, Ecosia has used profits to plant trees where they’re needed the most, combatting the global challenge of deforestation — 54 million trees and counting. A project of Campus Technology Services, Laker Print enables students to not only share centralized printers, but to queue their jobs up wirelessly and print them only when ready to pick them up, without printing banner pages or sheets with their names. The system is projected to save 120,000 sheets of paper a year, while also reducing confusion and wait times. * Friday will feature a collaborative event with the college’s Grand Challenges: Fresh Water for All project. Lucas Grove, a senior philosophy-psychology major, will put together an interactive display of his project. Grove has been collecting plastic cups on campus and turning them into filament for the library’s 3-D printers. He is using this filament to print aerators for household faucets, which then help reduce household water waste. For more information on the college’s sustainability programs, visit oswego.edu/sustainability.